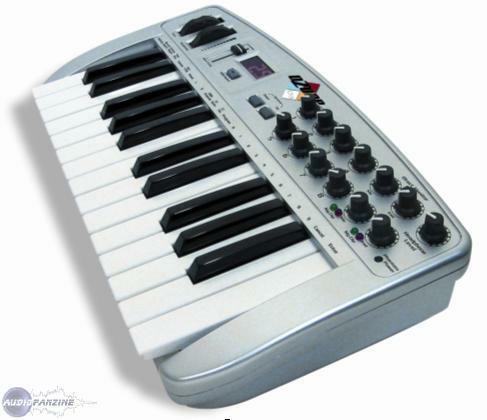 Ozone, MIDI + Audio Keyboard Controller from M-Audio. 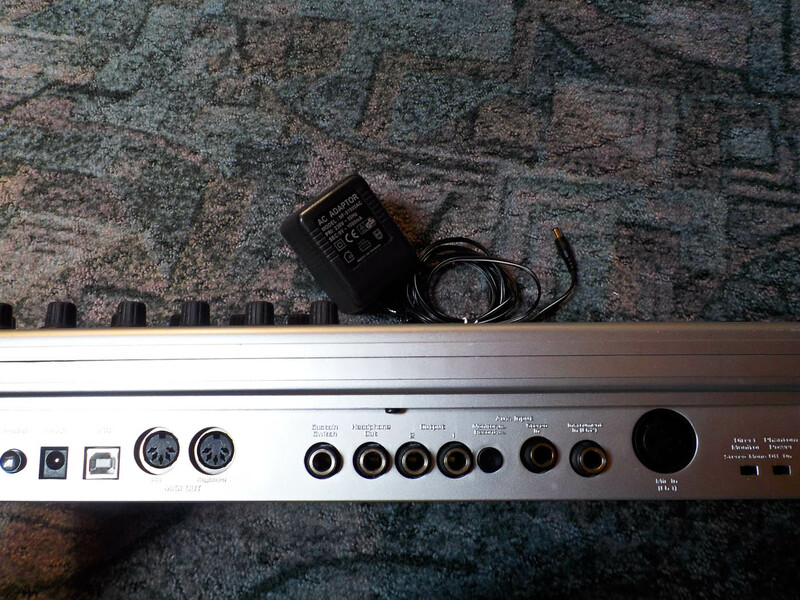 The M audio Ozone is a very small and compact midi keyboard that will sync up with your program even if there isn’t a preset config for it, you can just use generic controller. 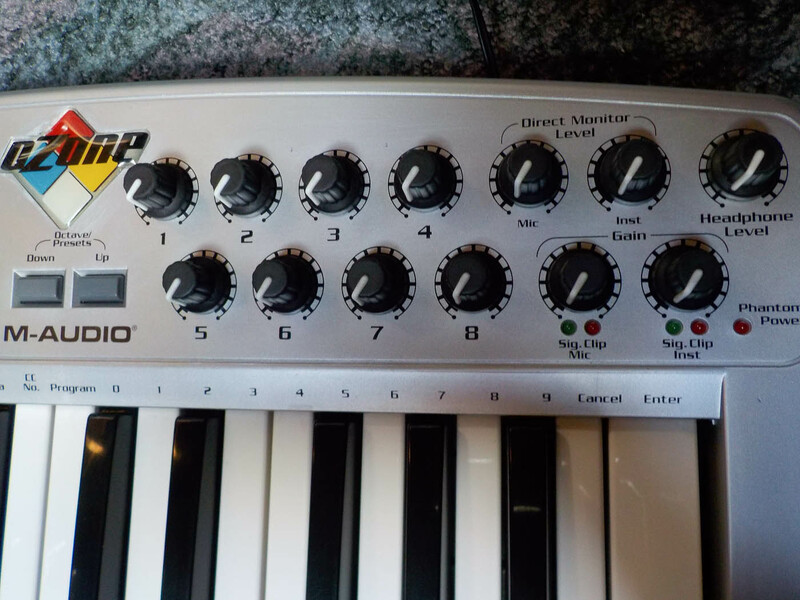 It has plenty of knobs that you can assign to what you want to assign them to. The pitch and mod will are pretty good for such a cheap (price) keyboard. Most of the keyboards in this price range are really plastic and the mod and pitch wheels are really stiff. 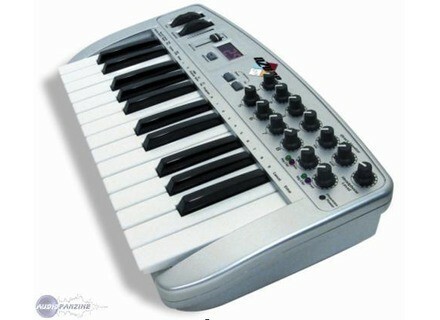 The M Audio Ozone is that bad though . Installation is as easy as it gets, just plug it in and put the disk In and you are good to go. Set it up in your software and start using it right away. You can set the knobs and sliders to do whatever you want them to do, you don’t have to follow whats printed on the keyboard itself. Getting started couldn’t be any easier with this you will have no issues getting it up and running. 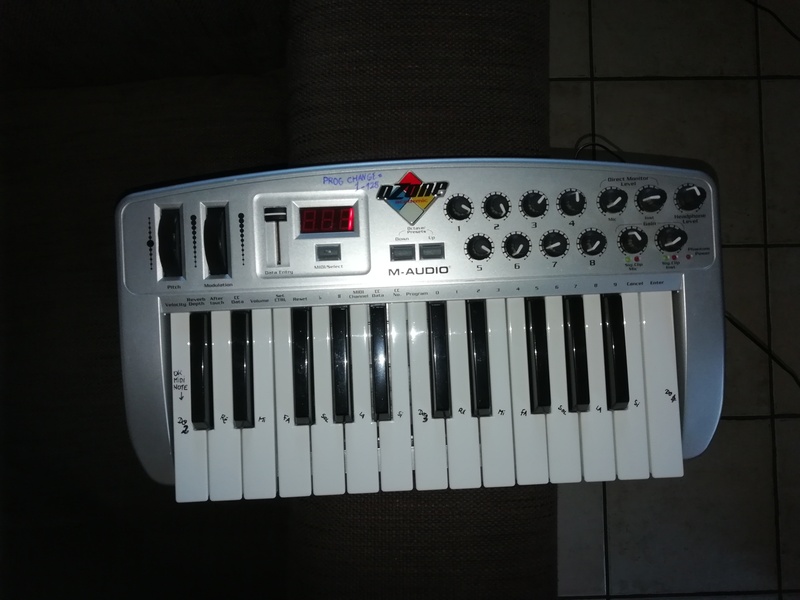 Overall, a great midi keyboard. Its very small and compact so you can put it in your laptop case and take it anywhere with you. I have used it on a plane before flying coach and we all know how small planes are with elbow room! Its very light and easy to use, nothing special with it. The price is great exactly what you would want to play for a similar product. 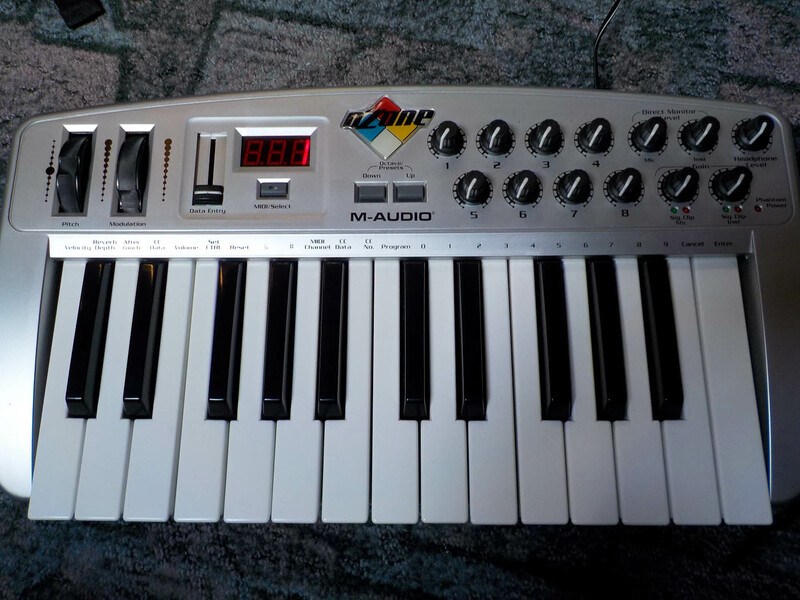 There really isn’t much difference between this and lot of other midi boards that are similar. They all do the same thing, until you start getting into the bigger full size midi keyboards and you will see they can do a lot more and have way nicer feeling keys than this one does. They keys on this one are kinda “toyish” though. Real stiff and plastic like, but they will loosen up after you use it for a while. Sometimes the computer reinstall tt alone (ss CD install) a driver at boot (10s). Without consquences on the config. In "very low", the latency is 10ms infrieure for MIDI DPIT basic config of my test (PIII 1Ghz 512MB). on the other hand, 20-25ms with a VST instrument plug-in. I have not tried to fix by hand. Finally, a product that rpond its specifications. And my expectations. 11/03: For the rich, will also see the Novation Remote 25 Audio. Everything I needed: keyboard / MIDI Controller and Audio Interface. used with Cubase SX / Reason / Ableton and lots more. I get to read and record many tracks at the same time in Stereo. not bad. I use it for over a year. the only problem I seem to come from my laptop. I'll sell it. with exprience, no USB audio on a laptop to make scne! Buy motivated by a little test at a friend .... maconfig: nforce 2 / 1700 / 512 ddr xp. Everything works THE FIRST ds installed, configured in 10 Seconds-one BMOL, rebooted the incapacit of the driver when a program that uses it is open. More from Reinstalling the plant Systm, readers or recording so make sure your system is clean. Ah ah: a default, the CPU load is one suprieure ncessite the equivalent PCI (the omni I had before). But hey saw the prx of proc athlon, I think if you want to stack the vst, a should not be too many probs. APRS is less flexible than the PCI may be, but many stores trs. Latency I get is minimal and does not over GNER pianist VST lowering the max. And for audio, direct monitoring erases any problem. Exceptional quality price ratio, keyboard trs enjoyable, good pramp, direct monitoring, especially for guitar or bass. No breath, his prcis dynamic between instruments made with a super convenient trs effective.